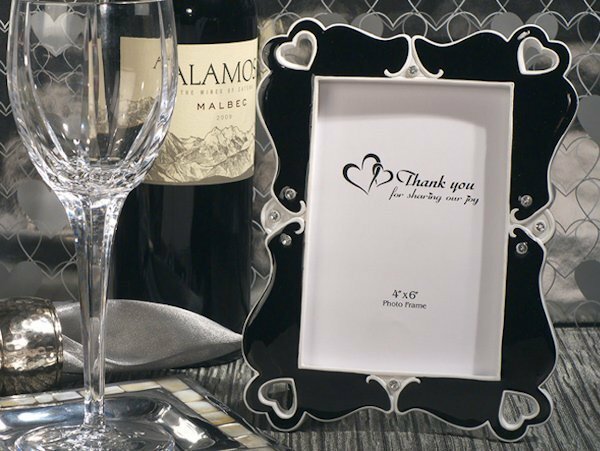 Contemporary and classy, our Elegant Hearts Black and White Photo Frame Favors are the perfect finishing touch to your special day. Send your guests home with a charming photo frame they will love to use for years to come. The stylish heart cut-outs and sparkling crystals that this black and white resin frame features makes this a great choice for your friends and family. We include a "Thank You" insert which can be replaced with a 4" x 6" photo. Each favor measures 5" x 7" and comes in a plain white box.